Diamond no Ace, a name that might not be heard as frequently as other largely popular sports shows out there. And that has always dumbfounded me. A show doing everything right, also up there as one of the best in its genre, yet still never has broke through the locks and that is evident with the relatively small amount of members it has on MAL compared to other popular sport shows. A collaboration of Madhouse and Production I.G., two of arguably the greatest ever studio's in this industry. With loads of experience behind them and even highly in the sports genre (Madhouse: Hajime no Ippo, One Outs and Chihayafuru. Production I.G. : Haikyuu! !, Kuroko no Basket and Prince of Tennis) coming together for the first time. And it was a long runner at that, so you could always expect them to deliver the goods. This will be a combined review of both the seasons, and also may contain spoilers. After having agonizingly lost in the finals against Inashiro a year ago and missing out on an opportunity to play at the National level, it was no other way but to try again for the highly lauded Seido High School of Baseball. And with many of the acclaimed senior players retiring from the team, things looked bleak for Seido. With new freshmen joining the team, it was always hard to build back the team and try to challenge other clubs. The characters as players also go through quite a lot development as they try to ramp up their game and take experience from the matches they play. Although Sawamura (aka Bakamura :p) remains the same idiot as ever, he actually does show what he's capable of and gets close to Furuya to become Seido's ace, and that inner battle between the two pitchers was amazing to see as always in the show. Miyuki Kazuya is the new captain of this refreshed Seido side, and we're treated to his super abilities as a captain and a catcher. He's the pillar of Seido which keeps the team intact. Quite a few of rivals and players have stepped up their game too, and we see a new rival for Seido in Yakushi with Raichi the monster-slogger and the cunning Sanada Shunpei, coming to the scene being better than before. The music for DnA too has never seized to amaze me. One after the other, DnA boasts of exciting new OP and ED songs. It also has a great set of OST's and Background Music that totally ignites the fiery and tense moments in a game. Good consistent voice acting all around, too. The animation is convincing for the fifty one episodes. They've stuck to the basics with little exaggerated movements and it doesn't have any sort of flashy moves or any otherworldly techniques that would be impossible to execute in a real match. The better players realize the situations and play accordingly, occasionally taking inspirations from what their coaches or fellow players might've said in the past. So DnA has had that realistic appeal all the time, something that makes this show all the more enjoyable. It's one of the best long-running sport anime there is. The enjoyment is worthwhile for the huge amount of episodes. DnA is a very simple show. We follow the dream of aspiring young baseball players and a club to play in the Nationals. It's a roller-coaster ride filled with endless excitement and emotions. You're probably thinking of an 7/10 a bit of a low rating, but I'm taking in the account of 5/10 being an average. That, I consider an exceptional score. I also currently follow MLB (Major League Baseball) and used to play baseball. I just want you to keep all that in mind. I first thought the 2nd season will be like the 1st season, this was going to be a long drag and have a pretty cliche/predictable story. This is considering having to go through the previous season’s 75 episodes, but still enjoyed it enough for the nostalgia and epic moments. What really makes this a great sport anime is the characters. There are so many character that I can’t even keep up. Each character has some kind of unique quirk, style, backstory, or even the way they're drawn is what makes them stand out. This certainly the case for Sawamura and new characters to follow. Many aren’t really one dimensional. The art direction is still solid, but not amazing. What really brought this score down was the art. There wasn’t really improvement since the previous season. I don’t mean the art was bad to begin with, but a lot of the characters are drawn inconsistently and the background NPCs are even worse. The backgrounds are sometimes inconsistent too. But the little details like the strings on the fielding gloves and the designs on the batting gloves are a plus. As for the sound, the OST is still amazing as in the first season and the openings/endings are just as good as well. Sound effects are nice too. This was also prominent in the 1st season as well. I’ve been hearing complaints of during the 2nd season of: “Oh is this Furuya no Ace?” or “When will Sawamura have the spotlight?” It seems some people don’t really understand why this is necessary. Although it is painstaking that Sawamura doesn’t really get to show his stuff and Furuya still butts in, this helps the MC develop. Without Furuya, Sawamura wouldn’t have a burning passion he does right now. Furuya completes Sawamura. Please don’t be like those butthurt fans. I just want you to keep that in mind into the 2nd season from the 1st. Starting this series was an impulsive decision while I was on a sports anime binge. I don’t regret it at all. Even though I’ve never watched a real baseball game and the sport is virtually non-existent in my country, I quickly grew to like it. 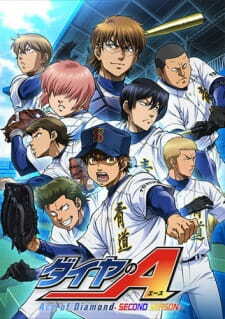 Its dynamic characters are Diamond no Ace’s (DnA) strong suit. They're all unique - in character design, personality, and purpose in the show. I fell in love with most of them from the first season and that never changed in this one. This show just has a knack for making you admire the players' efforts and camaraderie. The start of this season was bittersweet for me because the third years (who I loved and named my cats after) would shortly make an exit. Was I worried that DnA: Second Season wouldn't be able to fill the resulting hole in my heart? Yes. But they compensated for the loss by doing something that I've always wanted this show to do. It upped the focus on the non-First String players. With our favourite seniors gone, these guys had big shoes to fill and the opportunity to make their senpais and coach proud. Even if they didn't make the team, some characters still contributed significantly to it (in ways I won't spoil). DnA has a huge cast so it was refreshing to finally see side characters get some screen time. Concentrating more on Seido's side characters altered the cool way they presented side characters from the last season. In the first season, everyone had personality. Sometimes after learning the stories of opposing teams and their players, I wasn't sure who I wanted to win a match. Above all, each coach had a unique, adorable quirk. This time around some side characters just felt like cardboard. They could have done much more with Raichi in particular, who spent 65% of his screen time laughing asininely. It would have also been best to give less screen time to the pair of journalists covering the games. The animation was pretty good. My only qualms are that some scenes could have been done more fluidly with less (loooong) freeze frames and split panels to make certain bits of the game more exciting. Diamond no Ace (DnA) gets it right at key points during game play but not consistently throughout it. Even when the more artsy root is explored (for example: adding auras or other elements to a character/scene at crucial parts in the game), it fails to be compelling. The series makes up for it in the more humorous scenes, featuring chibi forms of characters, and the result is HILARIOUS and CUTE! The sounds effects were lacking. Some sounds were overused (constantly reused), which made hearing them more of a nuisance than something that improved the atmosphere of a scene. I grew tired of the random "ping" that they used during tense scenes, split frames or when a ball was hit. Plus, hearing that ONE track introduced whenever the game picked up (if you watched season 1, you know what I'm talking about) frustrated me. The soundtrack needed more diversity. I would have also appreciated hearing a common cheer that I could chant along with the team/crowd, like the crowd does in Haikyuu!!. Now for the good: the opening and ending themes were enjoyable. Never skip them. The story's pretty straightforward. A baseball team that missed out on nationals in the previous season tries again to achieve their ultimate goal. The journey to nationals isn't as straightforward though. You'll enjoy seeing the team members and coach develop throughout the season. Why? Because of the support they afford each other and the challenge that certain opponents pose. This is not the story of an OP MC. It's an authentic tale about the benefits of healthy rivalry, tenacity and teamwork. As a complete novice to baseball, I appreciated how explanations of pitches and plays...basically of anything baseball were easily incorporated into the story-line in a non-overbearing way. My only issue is with the directing; the pacing was horrible sometimes. Some games were far too long. The LITTLE plot development accomplished in one episode would annoy you. For me, that dulled the excitement. But, with the anime now complete, you might feel differently about that particular aspect. You won't have to wait one whole week to see that barely nothing in the game changed! "Doing the same boring thing over and over every day will surprisingly give you strength when it really matters. I want to live an easier life...but...life doesn't work that way." The 2nd season for Diamond no Ace keeps the hope of winning a ticket to national tournament alive! Story: Like almost every sport anime I have seen the goal is very simple indeed. (Baby Steps, Prince of Tennis) Still the story keeps surprising by different factors which are common in real life, not everything can go as planned. This is exactly why Diamond no Ace gives this refreshing "slice-off" life feeling. Even though the story isn't that awesome, they manage to perform so well. Main protagonists are pitcher Sawamura Eijun, Furuya Satoru and catcher Miyuki Kazuya, but because of this is about baseball a team sport we will also watch how other players will grow as a players. Story pacing is very good, individual elements like slice of life amazing! Especially the moments where pitcher was about to pitch felt thrilling. Ending was satisfying and almost just almost got tear. Art: Art is pretty memorable, but nothing "overly" unique. Animation is fluid through the whole series. Character design is well done and my favorite is Miyuki Kazuya. Best animations were in action scenes so pitching and batting were intense, well described and overall good. Background animations and so on weren't impressive quite dull, but at least they managed to do the most important thing right! Sound: Characters voice actors were very fitting and I liked a lot of Kataoka Tesshin voice. Background music was the most amazing of all sounds. They enhanced feelings like fear, excitement, frustration and the moment when you success and win! My favorite OSTS are Grow Stronger step by step, Grow stronger day by day theme of Sawamura (same kind of as the earlier one) and Climb over Wall. I think they are pretty much the same as in previous season. (Can't remember the one they used when batting to intensify the feeling). Openings (2x) are catchy, but I liked the final opening much more. Endings are good but nothing significant. Characters: Characters are almost well-rounded but for some odd reason there is a trend for little bit "dumb" characters. Fortunately it doesn't stick out that much that it would disturb. Characters reacted to things realistically especially in depression, feeling of the loss and victory. Character growth isn't that versatile but it happens when people want to learn from their mistakes or support their teammates. Sawamura learns to be more confident in his pitches and Furuya learns the responsibility as a pitcher. Characters like Sawamura, Furuya, Miyuki and Haruichi are more fleshed in the series than their teammates. There aren't any "villains" there are just amazing players who want to win for different reasons. I will remember especially the main characters I said and probably Haruichi and Miyuki better because I liked their design more. Sport anime can split opinions from one end to other end, but I started watching sport anime with a little hesitation, but pretty open minded. So yes, I think that non-anime fans can enjoy this if they are pretty close to sport overall. Re-watching this series will lower the emotions which were felt because successful and unsuccessful pitches and batting are remembered. This anime is memorable also because I don't watch that much sport anime but also because I enjoyed a lot considering that it's belongs to "sport" genre. This year saw plenty of adaptations of old manga as well as sequels to series which we've been crying out for. Let's review which anime climbed their way out of the ranks to become the twenty highest-rated shows of 2015!